Brushing off fierce Turkish censure of its offensive in the Hamas-ruled Gaza Strip, Israel urged Ankara on Sunday to consider cooling ties with the Palestinian Islamists and Iran. The Israel Defense Forces campaign, which ended in a Jan. 18 truce, triggered protests from Turkey culminating in a shouting match last week between its Prime Minister Tayyip Erdogan and President Shimon Peres at the World Economic Forum. Israeli officials have tried to play down the schism with Muslim, mostly secular Turkey, a key ally of Israel. CNN and other impartial media are downplaying the discussion between Turkey’s Prime Minister Recep Tayyip Erdogan and Israeli President Shimon Peres. The media in Turkey and elsewhere are playing up the dust up, claiming Israel insulted Turkey and the Israeli side apologized. That just isn’t so, Israel says. 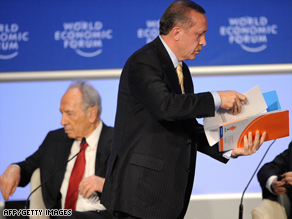 Above: Turkish PM Recep Tayyip Erdogan leaves the stage Thursday, as Israeli President Shimon Peres sits, left. Some media said Erdogan “stormed” out. This event highlights the volatility of the world situation and how the media can add to or slow down disagreements. Turkey’s Prime Minister Recep Tayyip Erdogan made it clear that he doesn’t much like the definition of terrorism adopted after 9-11 by George W. Bush. Erdogan, whose country has played a key role in trying to mediate among Israel and Syria and the Palestinians, said Obama’s new Mideast envoy, George Mitchell, will be in Turkey for talks Sunday. “President Obama must redefine terror and terrorist organizations” and make a new policy for the Middle east and elsewhere. When 9-11 happened and President Bush declared the “war on terror, many though israel immediately looked at palestinians as terrorists, Russia looked at Chechens the same way, China saw Tibetans as terrorist and so it went around the globe. No maybe a re-alignment or new definitions are in order. In his remarks toward President Obama and the U.S., most observers said the Turkish leader appeared to be referring to the US position toward Hamas and Hizbullah, which the United States considers terrorist organizations. Hezbollah leader Hassan Nasrallah said the administration of former President George W. Bush worked with its Arab allies to try and change the “realities” in Gaza before Barack Obama took office. Nasrallah says Bush administration worked with its Arab allies to “change the realities” in Gaza. 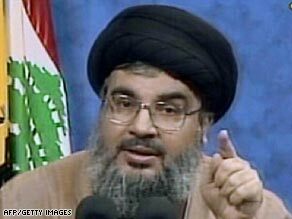 In a wide-ranging speech on Thursday marking “Freedom Day” — a celebration of the release of Hezbollah prisoners from Israeli custody — Nasrallah said the Bush administration worked with its Arab allies “in order to take advantage of the short time of Bush’s term and before (Barack) Obama takes office in order to change the realities” in Gaza. There were no U.S. forces involved in the 22-day Israeli military operation in Gaza; the United States is a key supporter of Israel. You are currently browsing the archives for the Erdogan category.